The second video track in Studio Ultimate often simplifies standard operations such as insert edits and split edits (L-cuts and J-cuts). An insert edit on the overlay track. The main video is obscured while the B clip is playing. 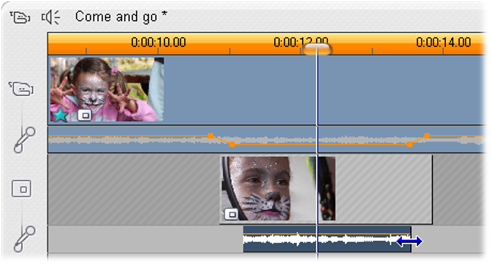 In the J-cut and the L-cut, the audio portion of a clip begins a little before (J) or a little after (L) the video. They are often used together to soften the start and end of an inserted clip. Split editing on the overlay track. 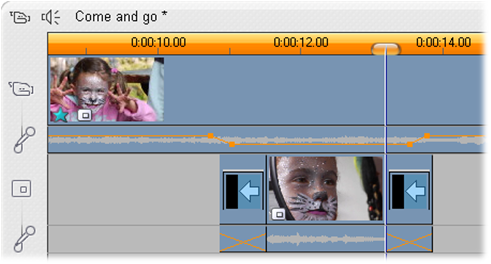 The overlay video track has been locked, allowing the B clip’s audio to be trimmed. The main audio can be reduced or muted as needed.